Glen T. Martin, Ph. D.
Dr. Glen T. Martin is Professor of Philosophy and Religious Studies at Radford University in Virginia and primary founder, in 1994, of the Radford University program in Peace Studies, of which he is currently Chairperson. He is also President of the Radford University Chapter of the American Association of University Professors (AAUP) and a member of its Executive Committee for over ten years. During his twenty-eight years at Radford University, Dr. Martin has been active in both national and international work of philosophers focusing on issues of peace. He has regularly presented papers at national conferences of the Concerned Philosophers for Peace (CPP) and the international conferences of International Philosophers for Peace and the Prevention of Nuclear and Other threats to Global Existence (IPPNO). 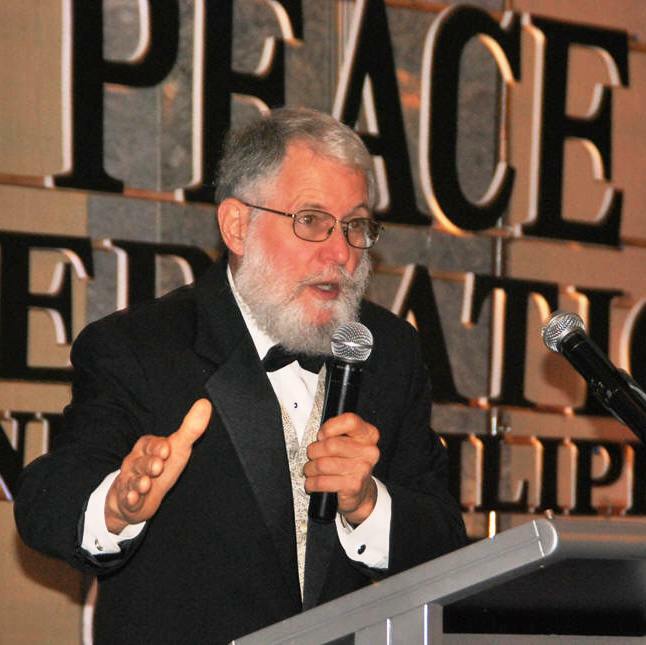 Since 1996, he has been President of International Philosophers for Peace (IPPNO), an organization with members in 25 countries that works to promote the social, political, and economic conditions necessary for world peace. IPPNO has Peace Messenger status with the UN and under Dr. Martin’s leadership has contributed actively to such UN related accomplishments as the 1996 World Court decision that substantially all use and threat of nuclear weapons is illegal according to international law, the International Peace Bureau’s successful campaign to curb French nuclear tests, the Abolition 2000 Caucus toward the total abolition of nuclear weapons, and the Millennium Forum conference on the future of humanity. Under his guidance, the IPPNO Document on World Peace was developed over a period of several years and was published by IPPNO in the year 2001. Dr. Martin’s pro bono work for peace includes honorary membership on the Advisory Board of the International Society for Intercultural Studies and Research (ISISAR), headquartered in Calcutta, membership on the Board of Advisors of the World Prout Assembly (WPA), membership on the International Advisory Board of Radio for Peace International (RFPI) (1998-2006), Costa Rica, membership on the Board of Directors of the New Humanity Center in Kalamata, Greece, appointment as a Global Associate to the International Institute for Sustainable Future, headquartered in Mumbai (2000-2004), membership in the Global Advisory Board of Human Dignity and Humiliation Studies (since 2010), membership in the Global Harmony Association (GHA), and member of the advisory board of Acme Intellects. From 1993 to 2002, he was Chairperson of the New River Bocay Project, a nationwide network of U.S. citizens working for the survival and sustainable development of the indigenous peoples of Northern Nicaragua. For a number of years Dr. Martin has been active in the movement to create non-military, democratic world government under the Constitution for the Federation of Earth. Since 1997, he has been a member of the World Executive Council of the World Constitution and Parliament Association (WCPA) which coordinates a network of people from 120 countries worldwide in their work toward these goals. At the Provisional World Parliament in Chennai, India, December 2003, he was nominated and confirmed as Secretary-General of WCPA. In 2012, he became President. As part of this work, Dr. Martin was a delegate to the fourth session of the Provisional World Parliament in Barcelona, Spain in 1996, to the fifth session of the Provisional World Parliament in Malta in 2001, and to meetings and conferences concerning world government in countries around the world.He was one of the organizers and Vice-President of the sixth session of the in Bangkok, Thailand, in March 2003, the seventh session in Chennai, India, in December 2003, the eighth session in Lucknow, India, in August 2004, the ninth session in Tripoli, Libya in April 2006, the tenth session in Kara, Togo in June 2007, the eleventh session in Nainital, India in July 2009, the twelfth session in Kolkata, India, December 27-31, 2010, and the thirteenth session in Lucknow, India, December 14-17, 2013. For many years Dr. Martin has traveled and lectured widely with respect to world peace and the need for democratic world government. Within this movement for world government under the Constitution, Dr. Martin is also a Professor and President of the Institute On World Problems, IOWP (www.worldproblems.net) and, before that, the Graduate School of World Problems, holding seminars in different locations around the world to train future leaders to deal with global problems in the light of democratic world government. The IOWP is a think tank directed toward global issues and their solution. In May and June 2002, he was professor in Graduate School of World Problems seminars being held in Takoradi, Ghana and Lucknow, India. In June 2003, he was professor in a seminar on world problems for the IOWP in Kara, Togo, in January 05, in Kolkata, India and in Kameoka, Japan, May 2005, in Tepotlzan, Mexico, March 2007, in Kalamata, Greece, in June 2007, in Colombo, Sri Lanka, in Lucknow, India in June 2008 and in San Jose, Costa Rica, January 2010. In 2011 and 2012 he similarly gave lectures and workshops in a number of countries; He is currently President of the Institute On World Problems. Dr. Martin is a regular contributor of political editorials to various newspapers, newsletters, and web journals. Dr. Martin has received world peace awards from several international organizations and, in 2002, he was nominated for the prestigious Mahatma Gandhi International Peace Prize awarded annually since 1995 by the government of India. He was voted as Press Action hero of the year 2003 for one of his political editorials. In March 2007, he received the World Peace Leader Award from the Office of the World Peace Envoy in Thailand. He has also published widely in the service of world peace and a transformed future for humankind. Author of From Nietzsche to Wittgenstein - The Problem of Truth and Nihilism in the Modern World (Peter Lang, 1989) and, Millennium Dawn - The Philosophy of Planetary Crisis and Human Liberation (Institute for Economic Democracy Press, 2005), he continues to publish many articles and reviews on a variety of topics in comparative philosophy, the spirituality of human liberation, economic democracy, democratic world government and global social issues. He is also author of the booklet Century-twenty-one: Crossroads for Humanity - The Manifesto of the Earth Federation (that was ratified at the Seventh Provisional World Parliament in December 2003 as the official manifesto of the Earth Federation), editor of World Revolution Through World Law - Basic Documents of the Emerging Earth Federation (2005), and co-editor of Emerging World Law (2010). His fourth book on a transformed future for humankind was Ascent to Freedom: Practical and Philosophical Foundations of Democratic World Law (IED Press, 2008). It examines the rational and moral grounding for democratic world law under the Constitution for the Federation of Earth. Martin's fifth book is called Triumph of Civilization: Democracy, Nonviolence, and the Piloting of Spaceship Earth(2010). It studies the deep violence of our current world order and shows the ways in which authentic democracy can transform the world to one of sustainability, justice, peace, and nonviolence. He has also published A Constitution for the Federation of Earth: With Historical Introduction, Commentary, and Conclusion (2010) which focuses on the Earth Constitution in its historical, conceptual, and planetary contexts. In 2011, his seventh book appeared entitled The Earth Federation Movement. Founding a Social Contract for the People of Earth: History, Documents, Philosophical Foundations. This book lays out the history and principles behind the Earth Federation Movement and includes documents to illustration the principles. In June of 2011, Martin did a lecture tour that included Lucknow, India, Colombo, Sri Lanka, Chennai, India, Dhaka Bangladesh, and Bangalore, India. In July, he led a seminar on the Earth Constitution in the Adirondack Mountains of New York State. In Chennai, Martin received the "Lighthouse of the World Award" for his work for world peace, awarded by WCPA (Asia Wing) and Bharat Vikas Parishad on the occasion of the "Global Challenges to Peace" Program, Pondicherry and Tamil Nadu, India 21 June 2011. In January 2012, he left the office of Secretary-General of WCPA and was elected as its president. Martin's newest book appeared in September 2013. It is called The Anatomy of a Sustainable World: Our Choice between Climate Change and System Change. This book shows in detail what a sustainable world would need to look like and how the Earth Constitution provides exactly the institutional structures that are needed. In November 2013 he was awarded the International Gusi Peace Prize, which is conferred in person each November in the Philippines.